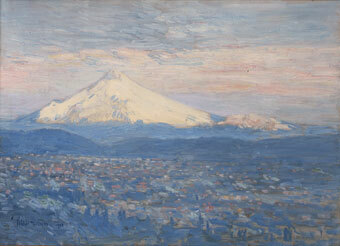 Childe Hassam (American, 1859-1935), Mount Hood, 1908, oil on canvas, Gift of Mr. Henry Failing Cabell, no known copyright restrictions. 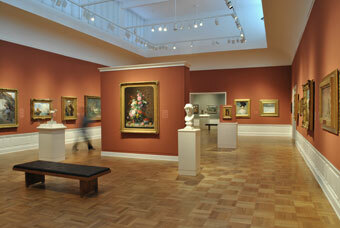 Since its founding in 1892, the Museum has amassed a significant collection of American paintings and sculptures. Located on the second level of the Main Building, the collection has grown primarily through gifts and key purchases of works by artists of national acclaim. Arranged chronologically, the collection provides an overview of the history of American art. Early portraits by Gilbert Stuart and Erastus Salisbury Field join acknowledged late 19th–century masterworks such as the magnificent Mount Hood by Albert Bierstadt, The Sculptor and the King by George de Forest Brush, and Thomas Moran’s The Grand Canal, Venice. The collection also features paintings by the great 19th–century landscape painter, George Inness. The collection is rich in works by American Impressionists Childe Hassam and J. Alden Weir, including paintings created during their visits to Portland in the early 1900s and Weir’s portrait of Museum founder C.E.S. Wood. Other works from the first half of the 20th century include paintings by artists ranging from Modernists Milton Avery and Marsden Hartley to John Sloan, George Luks, and other members of the Eight, a group of American artists that united to oppose academism.